Supply Caches, a Good Idea or Not? 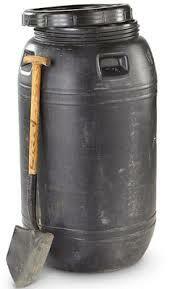 This type of barrel can make a good caches, but be sure to seal the lid well. Over the years, I have talked to many people who have cached supplies with different results. Some have went back to check on their caches and have never found them. Other were able to walk right up to theirs. Most of the caches I have heard or read about were made with PVC pipe or metal barrels or ammo cans coated with something like Henry roofing compound. The PVC pipe ones seemed to be the most common. It is cheap and easy to get. You take and cut the pipe to the length you want and glue end caps on. The downside to the PVC ones is that they are normally not very large. 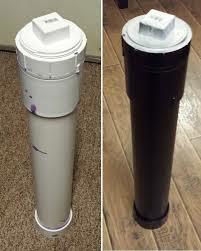 However, you can buy PVC pipe that is twelve inches or more in diameter. Most of the larger ones I have heard of were in barrels either plastic or metal. The biggest problem that I have heard of is people losing track of them. If you do not regularly check on them, the terrain changes, memories fade or other people find them. Today I have had people tell me that is no longer a problem because of GPS. But I wouldn’t count on the GPS system working when you need the supplies. If you decide to bury a cache, it needs to be well thought out. First, be prepared to lose anything you put in it. Second make sure it is watertight and well sealed. Put silica jell in to absorb any moisture. Third, make sure that you have good landmarks to help you find it. Fourth, it is best if it is somewhere that you drive by occasionally to watch for changes, such as new construction or dirt work. I knew someone who lost a cache when a building was erected over theirs. Caches can be good but they require some maintenance. They need to be checked periodically. This entry was posted in bugging out, security and tagged cache. Bookmark the permalink. 5 Responses to Supply Caches, a Good Idea or Not? Don’t use things that can be quickly and easily destroyed or moved as your landmarks. I read an article a few years back where that author went back to look for a cache he put in when Clinton was first elected into office. He said he found the dead tree he placed over the top, but after a few days of looking because the other trees he used as landmarks had been cut down. Trees are not good landmarks, especially dead ones. Use permanent landmarks. When we put in minefields we used things like prominent and easy to find points on a ridge line, center point of intersections, cultural landmarks (memorials, plaques, statues, etc..), corners of bridges (really the edge of the abutment since a bridge can be blown), and if it was short term placement intersections of waterways (they do shift over time). You want something that can not be changed quickly and easily. GPS is a good idea but you really need to have the info on paper also (satellites can be taken out by other satellites). Just like everything else have back-ups. There are lots of videos, books, and blog posts on caching. Read several when deciding how and where you are placing yours. Favored cache sites used by Italian partisans during WW2 were at intersections of stone walls, under the corners of sheds and barns, tucked inside stone or block walls during construction, or buried in a freshly dug and well-marked grave. Indeed, fake graves were ckmmonly used for this purpose. for the preppers in the frozen northland – consider the concrete hard frozen ground when you cache ….. and the possible snow accumulation …. finding it and digging it out might kill you before anything else does …. Using many of the suggestions posted here, and other’s ideas, we store in many ways. None of them are greater than the others, we keep containers small and use various locations. The old saying about keeping all of your eggs in one basket holds true here. Using one location, one type container, one storage method, etc. is a path to failure. Thank you for the great ideas and articles. MUCH appreciated. During my trip to Italy several years ago year I was also shown how WW2 partisans made use of hasty, expedient caches, bundling small items in grain sacks, hoisting them up high in trees, camouflaged with brush, so they would be well hidden until they could come back to get them later. This short-term, expedient method was used for small items considered dangerous to be “caught with,” by the enemy, such as portable radio transmitter sets, spare radio “valves” (tubes), batteries, pistols and ammunition or grenades. The key to a tree cache not being found is using a brushy tree, located well off any road or trail which may be climbed high enough so that the end of its tag line is hidden well above head height, tied securely and then completely concealed by bark, in brush or tucked into a knothole. Enemy patrols would quickly locate dirt, stones or brush which looked out of place, but seldom looked up high into trees. An expedient tree cache requires no digging, and can be exploited quickly when suitable trees have been pre-scouted. It is absolutely vital that tag line blend with the terrain and be well hidden to leave no visible evidence of its presence. Typical “grab & go” caches, were placed in metal food or ammunition cans, wrapped in oilskin, grain sacks or tent canvas, sometimes further camouflaged in netting, then hoisted 10 meters high or more up into a tree with cord or wire. Once positioned the cache looks like a squirrel nest. When planned ahead this enables you to travel into the bush quietly and quickly, lightening the load, by stocking replenishment supplies ahead of time.